Bytox Hangover Patch is an easy and convenient hangover prevention, but unfortunately doesn’t provide great results. The best part about the patch is that it’s incredibly easy to use. You simply wear the patch while drinking. Luckily, I didn’t experience any side effects from this product. It doesn’t have a taste or smell, which I love! I also love that it isn’t itchy, irritating, or even noticeable. The downside is that I woke up the next morning with a hangover. The patch didn’t prevent a hangover, which was incredibly disappointing. I did recover much faster, so I think the patch did shorten my recovery time. One of my favorite things about the Bytox Hangover Patch is how easy it is to use. You simply apply the patch to a dry hairless part of the body. You should apply the patch at least 45 minutes before drinking and leave it on for at least 8 hours after you have stopped drinking. I really like that the patch doesn’t itch, goes on easily, and doesn’t require any work. It’s so easy to use because you don’t have to constantly be consuming hangover preventions; you simply apply it before you start drinking and leave it on until the next morning. The patch doesn’t itch or cause any irritation. Honestly, the patch is hardly noticeable. I totally forgot I even had it on which I loved! This is where I was bummed. The Bytox Hangover Patch is so convenient to use that I had high hopes for the product to produce AWESOME results. Unfortunately, the morning after using the patch, I woke up with a POUNDING headache and nasty nausea. I also felt exhausted, weak, and dizzy. YUCK! I was extremely disappointed waking up with such horrible hangover symptoms. Luckily, the symptoms only lasted a couple of hours, so I attribute my faster recovery to the patch. Overall, I wouldn’t suggest the patch because it didn’t really prevent a hangover, but I believe it did shorten my recovery time. The Bytox Hangover Patch contains a myriad of healthy all natural ingredients. Like may other hangover products, Bytox contains Vitamin B complex. It has Vitamin B12, Vitamin B3, Vitamin B2, Vitamin B5, Vitamin B6, and Vitamin B1. B Vitamins are essential for your body. After drinking alcohol our body becomes depleted of essential vitamins like Vitamin B. 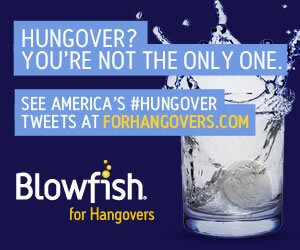 B Vitamins supposedly help with energy and overall recovery from hangover symptoms. Another common hangover cure ingredient that the patch contains is Green Tea Extract. Green Tea is believed to be a powerful antioxidant that protects the liver. Acai Berry Extract is another key ingredient in the Bytox patch. It supposedly assists in regulating your digestive system, detoxing your body from harmful chemicals, clearing your skin, and reducing the signs of aging. It costs $14.99 for a package of 5 patches. That works out to about $3.00 per patch. 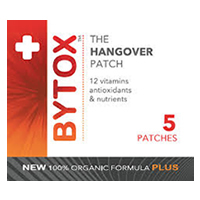 The Bytox Hangover Patch is one of the more expensive hangover cures I have tried, but it’s still reasonably affordable. Unfortunately, the Bytox Patch doesn’t have a satisfactory money-back guarantee but you can return any unused/unopened Bytox product for a full refund within the first 30 days.